Congratulations to the UP Pep Squad for bagging the championship title in the 2010 Samsung UAAP Cheerdance Competition. *This youtube video was uploaded by user onnybengan, used here solely for academic and non-commercial purposes. The U.P. College of Human Kinetics in its celebration of the U.P. 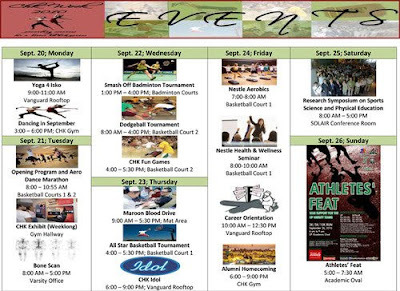 Diliman CHK Week is organizing a “Research Symposium on Sports Science and Physical Education” on September 25, 2010 at the U.P SOLAIR Hall. This event will provide the participants with the opportunity to exchange information on the current trends on the various fields in Sports Science and Physical Education through presentation of scientific papers, which will be orally and poster presented. This will also serve to promote goodwill and collaboration among the different colleges and universities.